In 2012, biochemists Jennifer Doudna and Emmanuelle Charpentier first identified the genome-editing mechanism known as CRISPR-Cas9. Last fall, Chinese scientist He Jiankui announced he had used the tool to edit the DNA of twin embryos to increase their HIV resistance. Apparently working on his own, against the strong objections of fellow scientists, He opened a door to the future that cannot be closed. Long before He's announcement, bioethicist William Hurlbut of Stanford University had spent hours with him discussing the ethics of human embryo research, his moral objections to it, and its potential impact on the human story. "He Jiankui put everybody in the world on notice that the future is coming faster than we thought, that there are serious and powerful challenges emerging with the power of our advancing technologies. We need a broader, deeper conversation collectively as a human species as we enter into this very significant arena of intervention in human life. Otherwise, these new technologies will be misused with tragic consequences" (from an interview with Sophia Lee of WORLD Magazine, 1/19/19). 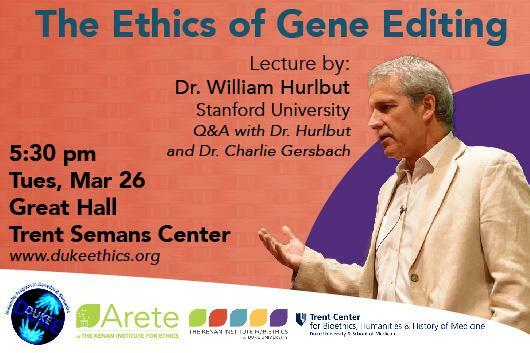 Bill Hurlbut will discuss the ethical issues surrounding human gene editing and how we should address them moving forward. Charlie Gersbach, Duke professor of Biomedical Engineering, will join Dr. Hurlbut for the Q&A portion of the event. Free and open to the public.